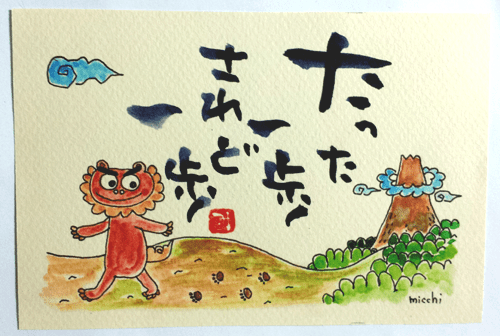 I got this postcard on Ishigaki Island. It sort of translates to “One step is still a step.” Even incredibly long journeys are just single steps strung together. It’s a great reminder that managing to take even just a single step is a really amazing thing. And the next step you take forward will also be an amazing thing. And the one after that, too. Just keep taking single steps forward and soon they add up to a journey.